This installation was constructed because of the public demand for growing food plants, even where there is little space in courtyards and on balconies. This installatiion uses recycle hardwood and plastic made from recycled printer cartridges in it's construction. There are 4 components to this display area. 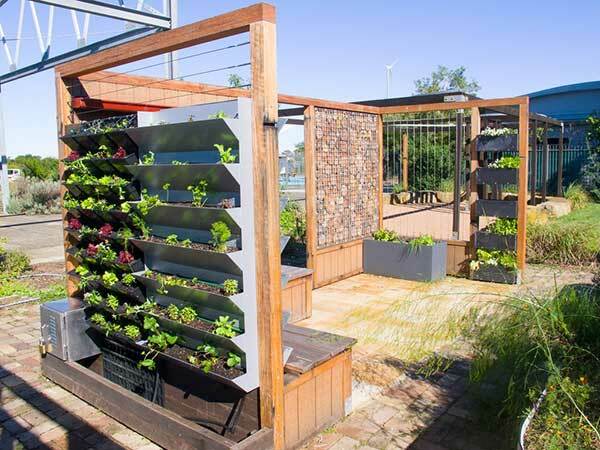 A number of vertical garden arrays, both DIY and commercial models, demonstrate that edible and other plants can be grown on vertical surfaces. The commercial models are those produced by Vgarden (metal) and Elmich Versiwall (black plastic). Other examples demonstrate how householders can make their own planters from recycled plastic planks made with Planet Ark recycled printer cartridges — Roocycle EW. Wicking Bed - not always around to water your garden? A self-watering or wicking bed planter is demonstrated for people who are not always home to irrigate their plants. A water reservoir filled with gravel or 100mm agricultural pipe and covered with geotextile fabric to stop soil going into the reservoir holds water filled through a vertical 50mm pipe. The garden, filled with organic potting mix and planted out, sits atop the reservoir. Bringing life to the garden with an insect motelDesigned to provide shelter to beneficial insects in the garden, the insect motel occupies one wall of the balcony garden installation. The insects form part of the garden's pest management strategy. They find refuge in timber offcuts with holes drilled in them. 150mm deep wooden blocks with holes drilled at 2-6mm in width and blocks of bundles of sticks are placed to accommodate species of solitary, native bees. The aquaponic component of the balcony garden installation demonstrates how table fish can be grown in combination with vegetable crops and other plant types. The fish and vegetables are produced in what is a semi-closed set-up. A small pump circulates water rich with fish waste from the pond through a gravel grow-bed (gravel is from crushed recycled terracotta roof tiles), feeding the plants. The plants filter and clean the water that then goes back to the fishpond. All the householder does is add fish food, monitor the water and harvest fresh veggies and fish for the frypan.